Size is 145 x 57 x 29mm (excluding switch, sockets etc.). The case is made from single sided unetched PCB. See original Fredbox at G3XBM's homepage. Front panel layout. Charging LED is lit only while charger is plugged in. Charger socket is 2.5mm. 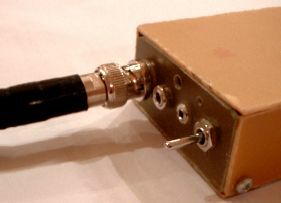 Fredbox with whip antenna plugged in. 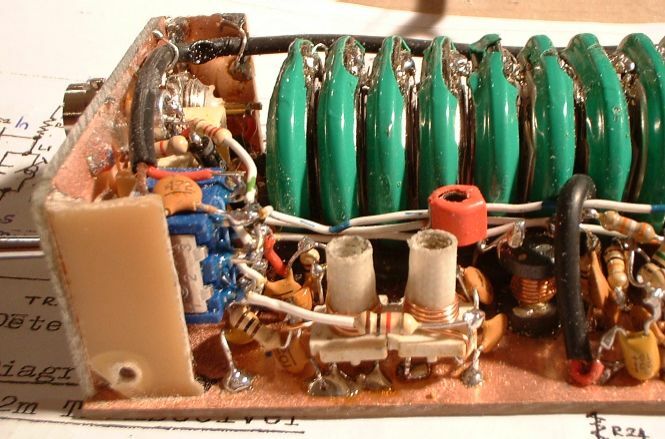 Internal view, showing circuit sections. Construction is "ugly" on single sided unetched PCB, which also forms one side of the case. Closeup of receiver section. 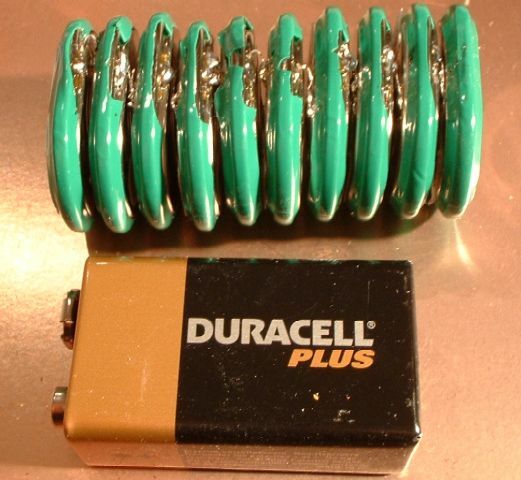 The two coils in the foreground are L1 and L2, note also the miniature red trimmer capacitor VC1. 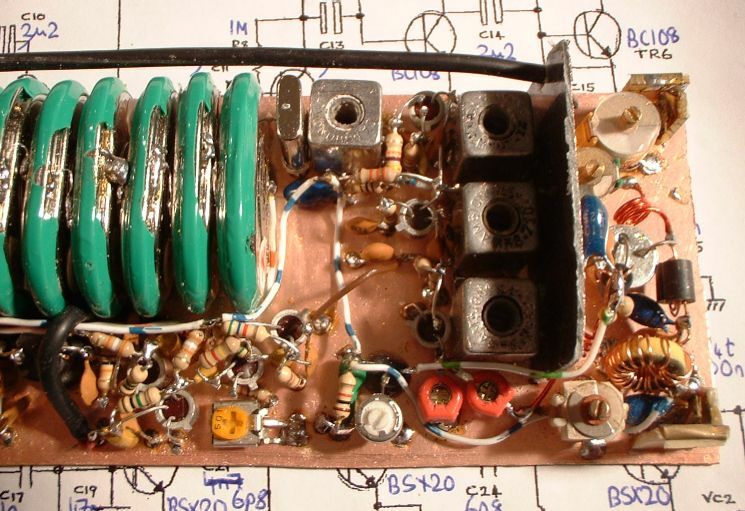 Closeup of transmitter section. Microphone amp is lower left. Crystal and doubler top right. Note PCB-stock screen between the doubler and the linear. 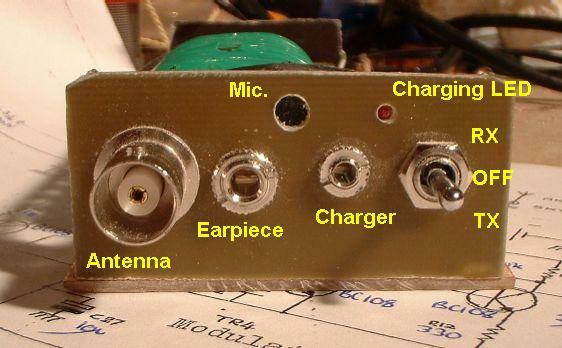 VHF linear is from Harry's Homebrew. Battery pack under construction. 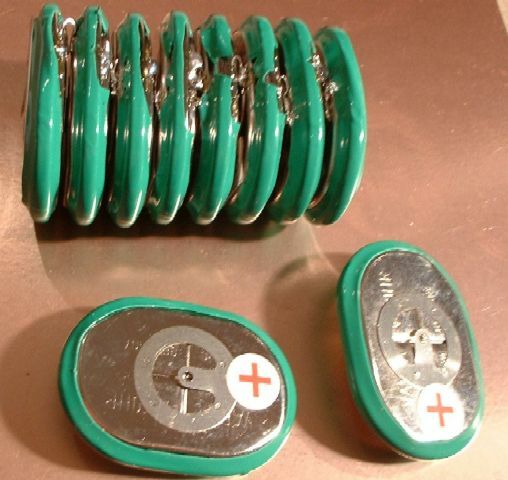 Uses ten NiMH cells with 600mAh capacity, to make a 12V 600mAh battery pack. Battery pack is slightly larger than a standard 9V PP3 battery. 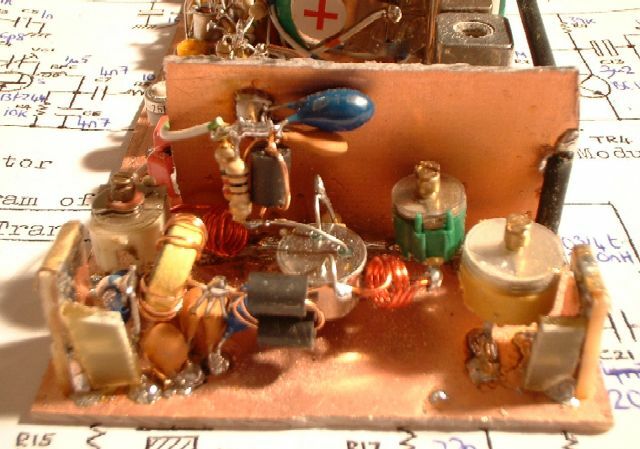 "INDUCTANCE LAB": an SA602 circuit connected as oscillator and feeding my homebrew spectrum analyser. 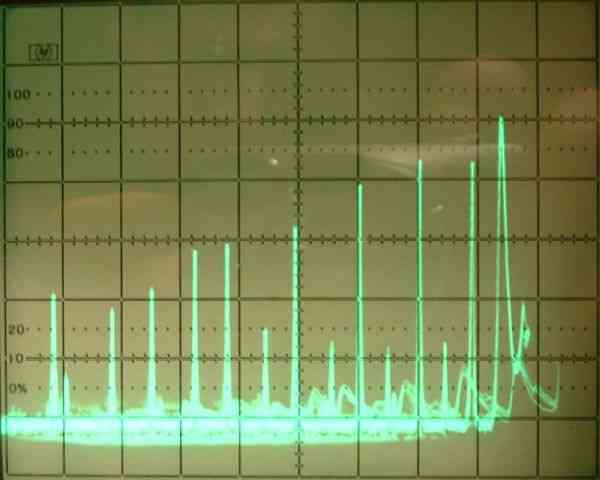 Typical spectrum analyser screen, showing the internal 10MHz marker calibration signal which can be used for a sufficiently accurate frequency measurement to calculate the inductance. 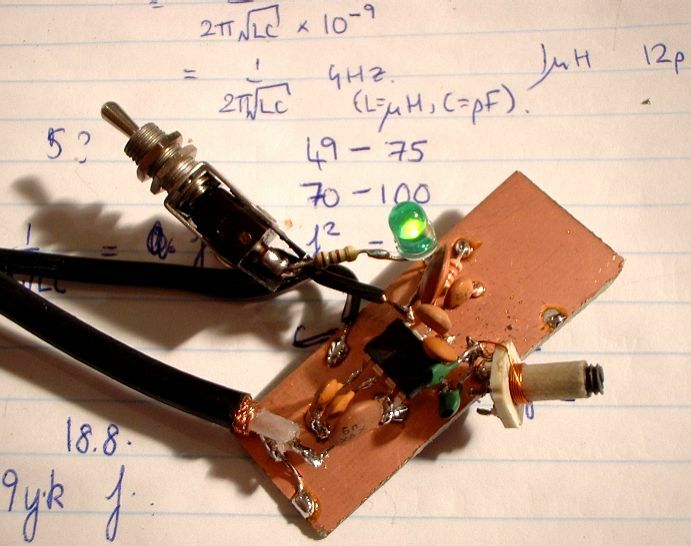 Circuit diagram as I have built it. Spectrum at output of crystal oscillator and doubler. Scale is about 60MHz (right hand side) to about 80MHz (left hand side). 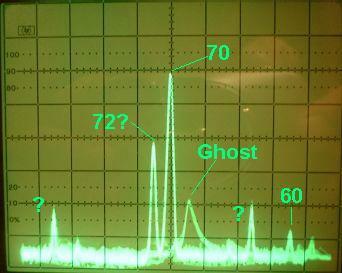 The peaks labeled 60 and 70 are harmonics of the 10MHz marker generator in the spectrum analyser. 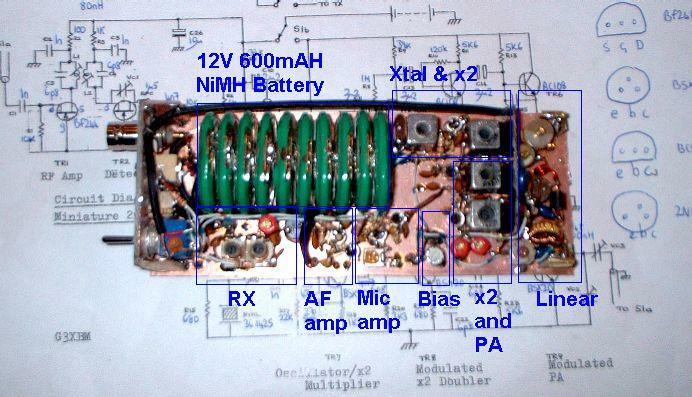 Note two "sideband" type signals of the 72MHz signal, which are marked with a question mark. "Ghost" image is caused by flyback of the ramp generator in the spectrum analyser, and really I should put a blanking circuit in. G0UPL's kitchen table! Fredbox in the foreground. 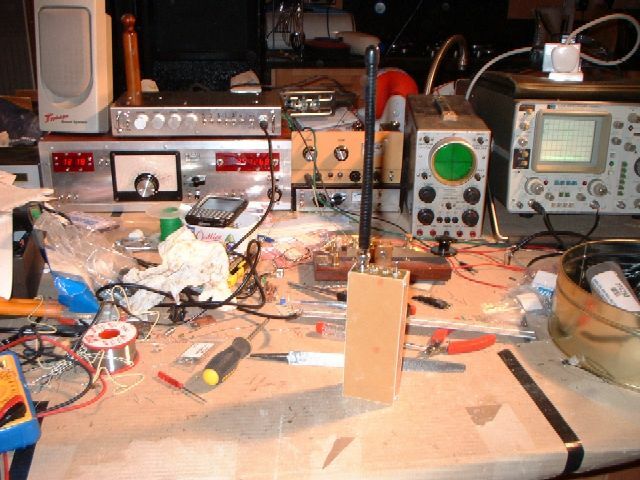 Behind that (roughly left to right): PSU, loudspeaker, HF receiver, spectrum analyser, 1-valve 80/40/30/20m CW TX, ATU, Heathkit 'scope, HP1741A 'scope connected as spectrum analyser display.